Level 4-3 is the third level of Spooky House in Mario vs. Donkey Kong. The high score for this level is 31500. The level opens with a cinematic showing Mario jumping onto a lift and riding it to collect a Present, then jumping to another lift and riding it to a platform. The player needs to ride the first lift, and the player can either ride it to reach a blue Color Switch to create a platform between the two lifts, or do a Handstand Jump from the first lift to reach the second one. Riding the second lift to the left, the player needs to press the yellow Color Switch then jump back onto the lift or the platform below. Returning to the first lift, the player needs to use the new yellow stairs in its path to reach the Key they need to grab, and then the player needs to press the blue Color Switch and wait for the lift to return. 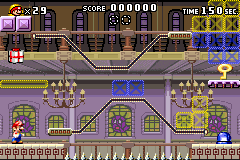 Using the blue platform between the lifts, the player needs to return to the yellow Color Switch and climb the yellow stairs to the right. The player then needs to use a third lift to reach the platform with the locked door. In the second area, the player needs to press a blue Color Switch to turn the blue Polterguys into platforms so the player can cross the spikes. The player then needs to time a press of the red Color Switch to position the red Polterguys above in a way that the player is able to jump onto them by using the Springboard. 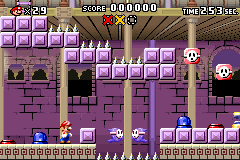 After crossing some spikes by using three Falling Spikes as platforms and then climbing a ladder, the player needs to press a blue Color Switch as a blue Polterguy is under the ladder on the right, and beyond these Polterguys is a platform with a 1-Up Mushroom over it. After climbing the ladder, the player needs to press the red Color Switch as the red Polterguy is in the center of the gap to allow the player to reach the Mini Mario. Red: In the first area, directly above where the player starts. The yellow Color Switch needs to be active. Yellow: In the first area, in the top-left corner. The blue Color Switch needs to be active, and the player needs to perform a Handstand Double Jump from the blue platform below the Present to reach it. Blue: In the second area, above the third Falling Spike. The Loooong Journey • Athletic • Thwomp's Fortress • Dangerous Flower • Laser Panic! This page was last edited on April 14, 2019, at 15:48.